The national release of HIDDEN FIGURES on January 6 opened in 2,471 theaters, compared to 4,157 theaters for Rogue One: A Star Wars Story. Early Sunday figures reported that Rogue One was going to be the number one movie for the weekend, but, Janelle Monáe, one of the stars of HIDDEN FIGURES, said “The force was with us!” Snow on the east coast kept some people home Friday and Saturday, but once the snow starting melting people packed the theaters on Sunday, pushing HIDDEN FIGURES into the top spot. According to published reports on Monday, January 9, 20th Century Fox, the studio distributing the film, reported that HIDDEN FIGURES brought in $22.8 million, landing ahead of the $22 million mark hit by Rogue One. She adds, “Black Radio was able to utilize our collective voice to help spread the word and fill theaters. This was a unified effort, so congratulations to everyone who posted, tweeted, called friends or drove people to theaters. The ground-swell of grassroots support helped push this film over the top in attendance. This film has inspired millions of people across the country, especially young girls who are now considering futures in science, technology, engineering and math. Not to mention the fact that this film, which featured three strong, intelligent African American women as the main characters and main actors, has broken down the confining thought that African American women can not lead successful films domestically and internationally. 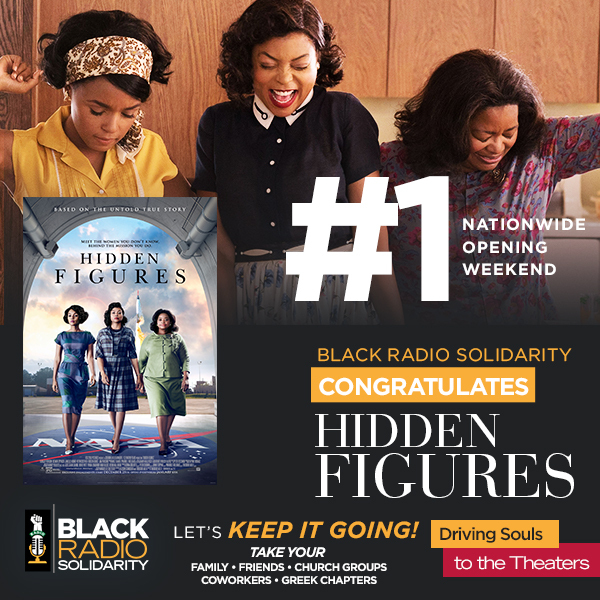 Black Radio Solidarity thanks EVERYONE who packed the theaters for this inspiring movie. Thank you to all of the individuals, groups, sororities and fraternities who went alone or in a groups; who went with friends or took children of all ages to be empowered by this page from American History. Sheryl Underwood Radio airs on 77 radio affiliates with a daily reach of 6.7 million listeners.